Welcome to All About Sewing Machines! We are your one stop shop for Sewing Machines Sales, Service and Accessories. 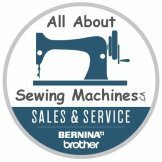 We are your proud Bernina & Brother Authorized Dealer Centre Located in Barrie, ON. We strive to provide a strong commitment to our service and pride ourselves in understanding the value of of good service and always go above and beyond to ensure that our clients receive exceptional service! We look forward to a long lasting relationship.